The Theme settings tab, located to the right of the Sections tab, lets you make global changes to the look and feel of your store through components such as Currency, Typography, and Colors. Virtually every color in Startup is customizable through labelled color selectors in this theme setting. Click on the swatch to edit the colors. 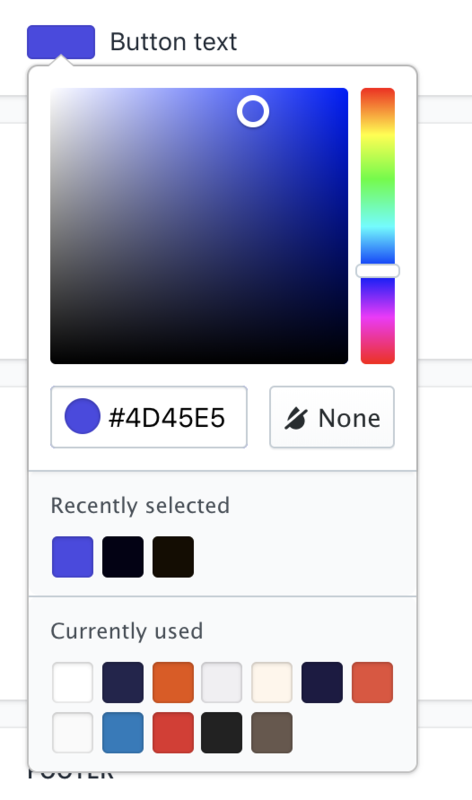 A popup with a color selector will appear, which allows you to adjust and experiment with custom colors. You can also add your own specific hex code to this editor. You can upload custom background images under Backgrounds. 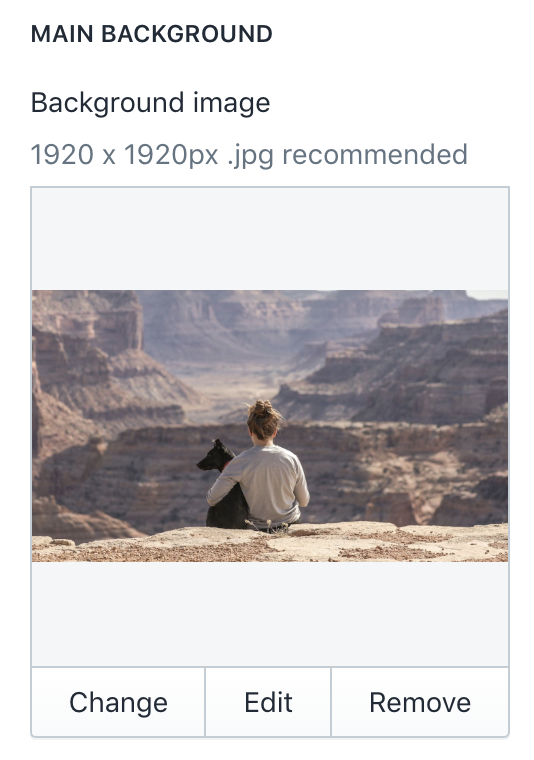 Notice that you can upload an image for Main background, Contrast background (which will display when "Contrast" is set as the style for a section, e.g. in a promotion bar), and Footer background. Note the recommended image sizes for each area. Startup comes with dozens of hand-picked fonts for your store. 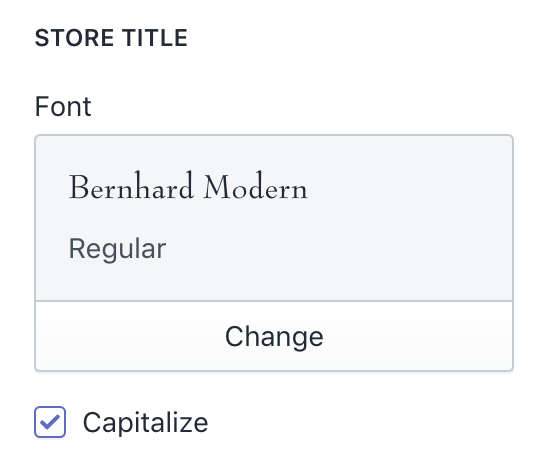 Custom fonts can be set for your store’s Base text, Store title, Headings, Section titles, Captions, and Buttons by selecting Change under the respective category. To add emphasis to certain sections of text, use the Choose style dropdown to set the text to Bold. You can also toggle on the option to Capitalize the text. Breadcrumbs are a secondary navigation that show the current location of the visitor on your website. You can show or hide breadcrumbs by checking the Show breadcrumbs option. The Product grid settings allow you to make global changes to the way users can view and interact with your products. 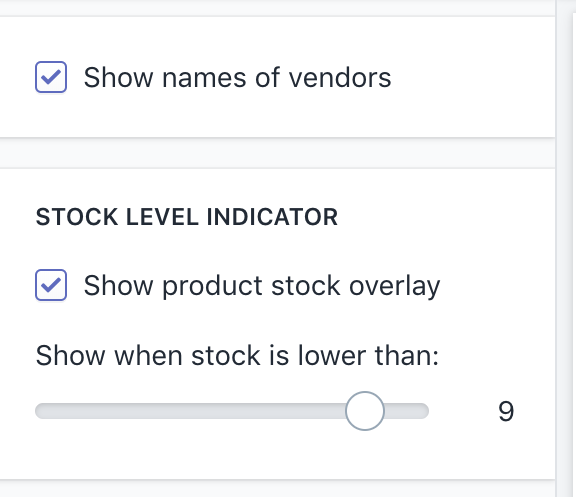 This includes the details that are included in product listings (like vendor names), as well as the Stock level indicator, a feature that displays the remaining inventory count when it reaches a configured amount. The Default social media sharing image allows you to assign a particular image that generally represents your store. This will display when customers share links to your storefront, but will yield to a more precise image in certain cases. 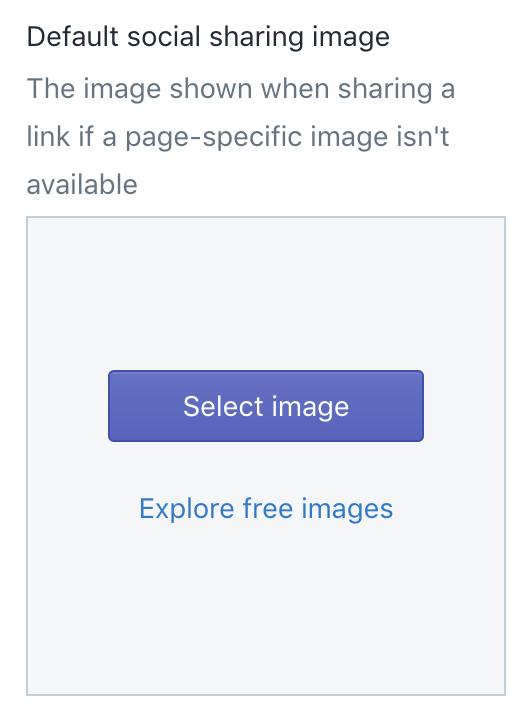 For instance, if a product page is shared to social media, the main image assigned to the product will display, but if a Contact page without images is shared, it would bring in this Default social media sharing image to accompany the link. Startup supports social icons for Facebook, Twitter, Google+, Pinterest, Instagram, Vimeo, and YouTube. Simply enter in your account URL in the relevant Account field and the social icons will automatically appear in your sidebar. You can also enable your blog's RSS feed here. If you would like to enable share buttons on your products and posts, check the Enable share buttons box in your social media settings. A favicon (also known as a website icon, tab icon, or bookmark icon) is a small icon that represents your website and provides a shortcut wherever the icon appears. Check out this article to create your own. Once you have an image you want to use, upload it by clicking Select image. 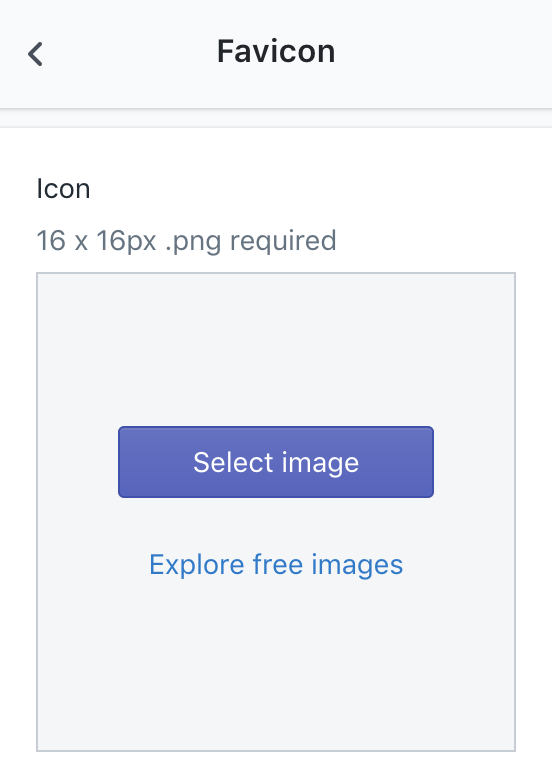 If you have already uploaded the image you want to use, select the image from your media library. We recommend a 16px by 16px PNG file. Shopify works in virtually every country and every currency. With Startup, you can cater to international customers with a currency converter that displays as a dropdown menu in the header of your store. This allows customers to dynamically update their prices throughout your shop. The banner is the top section of the checkout screen where your store name appears. By default, it is transparent (or whatever color your store’s background is) however you can customize it by uploading a custom Background image. We recommend images that are above 1000px in width to be optimized for larger window or device screens. If you want to add your store’s logo to the checkout page, simply upload a Custom image. You can use your storefront logo or you can upload a different one instead. You can also define the Position and Logo size by making a selection from the bottom two menus. You can customize more of the checkout settings from the Shopify admin.